Hiring workers is probably the wrong thing to think about. Let's worry about hiring capital goods. Some extra space for your business or some extra production equipment. You know the price of said capital and you know roughly what it does, but you're not sure whether you should buy it or not. You look to your left and you see a stack of dollars. You look to your right and you see a bunch of machines. Do you want to trade the dollars for the machines? It's a close call. Now a little birdie from the Bureau of Labor Statistics shows up and tells you that the price level is going to surge over the next three years. Suddenly your decision is made for you. That stack of dollars isn't as valuable as you thought it was. Buy the machines! So now the claim is that we don't need to separate NGDP (PY) growth into inflation and real growth because inflation changes investment decision. Let's go to the charts, people. I am sticking with the two time periods Ryan Avent chose in the post that started all this in order to not be open to the charge of cherry picking dates. The linear correlation beween the two series is -0.007. Yikes! The linear correlation between these two series is 0.78. 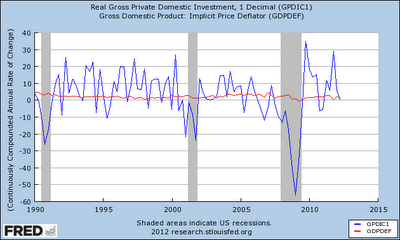 Inflation is uncorrelated with real investment growth, real growth is highly correlated with real investment growth. The linear correlation here is -0.174. The linear correlation between these two series is 0.83. 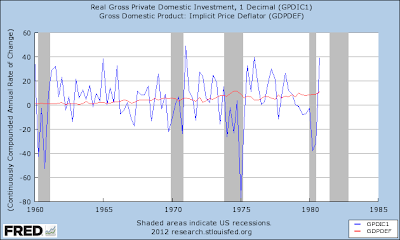 So in practice inflation is uncorrelated with real investment growth, while real GDP growth is incredibly highly correlated with real investment growth. So it seems, yet again, that business decision makers DO distinguish between which component of NGDP are changing, and if it's the P component, they ignore it when making decisions about changing employment and changing investment. The US economy in these time periods at least, was not caught in the grip of money illusion. For what purpose does the gentleman from Oklahoma rise? The gentleman is recognized for one more blog post. 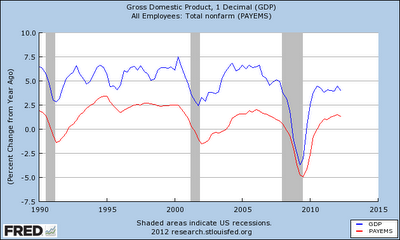 Nominal GDP growth is a sum (sort of) of two things. Real Growth and Inflation. Both are outcomes. The two things are not highly correlated with each other. One of them we like and one of them we (usually) don't like. MMTers (NGDPists) frequently show graphs where a decline in output is correlated with a decline in NGDP and exclaim something like, AHA! 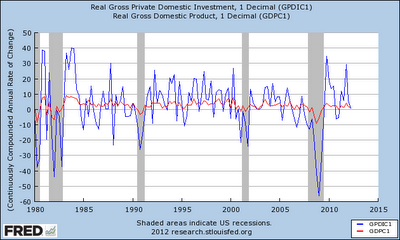 THE FED HAS CAUSED THIS DECLINE BY NOT KEEPING NGDP GROWING FAST ENOUGH. As I was pointing out yesterday, that can be a very tricky case to make because the decline in output is baked directly into the decline in NGDP! That's what I thought (and still think) Mr. Avent was doing yesterday. But I don't think I actually called him an idiot as he seems to think I did though. But then again I am so dense that I fail to understand exactly how the Fed is supposed to precisely target NGDP. They've kept the policy rate at zero for multiple years and promised to keep it there for multiple years more. They have flooded the banking system with reserves. But NGDP has not grown fast enough. Now the Fed has promised to keep the pedal to the metal after the economy has recovered, will that get NGDP growth where the MMTers want it? 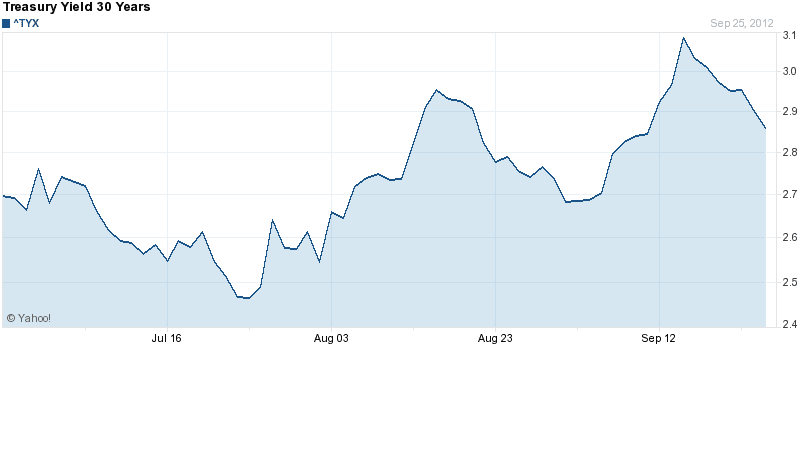 Create a futures market for NGDP and target its price? Rely on the reverence people have for Fed announcements and sit back and watch NGDP happily conform to the announcement? NGDP is “the real thing,” whereas P and Y are simply data points pulled out of the air by Washington bureaucrats. The man who implores us to "never reason from a price change" is now informing us that distinguishing between price changes and quantity changes is irrelevant or impossible? Even in tough times, some people get raises. Those people capture some of the growth in nominal incomes, leaving a smaller chunk available to go to new incomes. That's a real puzzler to this Okie. 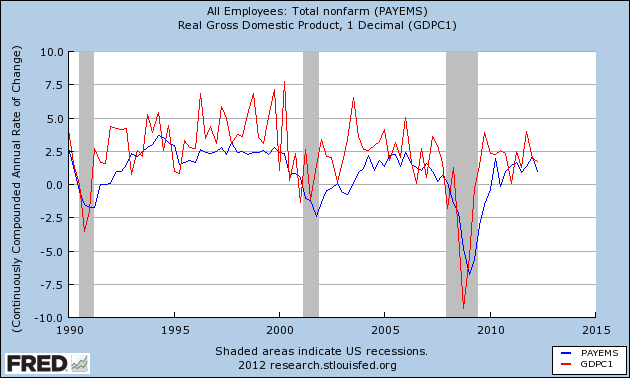 The raises ARE growth in nominal income, aren't they? Or does the Fed pour nominal income over the economy like cereal and we all scramble to grab our share and eat it before it's gone? Nominal income is not an exogenously imposed constraint on the activities of the private economy. 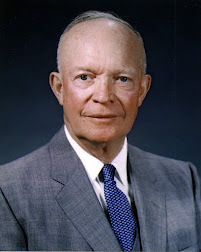 Nominal income is largely created by the actions of the private economy. I guess I just don't speak MMT very fluently. Please find attached an article that has just been published in Politics, one of the flagship journals of the UK Political Studies Association. Politics seeks to publish timely, research-led reflections on the start of the art, the state of the world, and the state of disciplinary pedagogy. After consulting with the author, we identified you as one of the key experts in this particular field. Therefore we felt that you might like to see the article, entitled The Incumbency Advantage in the US Congress: A Roller-Coaster Relationship, as soon as it was published. We hope it is of interest. Please get in touch if you have any questions, and do consider Politics as an outlet for your own research in future. And I'm thinking, okay, finally I get the respect I am due in this world. I have published several papers on incumbency advantage, and the effects of incumbency on campaign contributions. So, cool. I look at the paper, and it never cites me. Now, that's fine, too. My papers on incumbency advantage are deservedly obscure, perhaps. Fair enough. A paper is published that doesn't cite me, no complaints. Here's my question: Why BOTH? Why would someone single out a scholar, in another country, to receive a special copy of a paper that deals with a topic in which I'm a "key expert," and not cite that "key expert's" own work? The only possible effect is to piss off the "key expert." Why contact someone whose work is relevant, when you clearly don't really think the work is relevant? Oh NGDP, is there anything you can't do? In a long post over at Free Exchange, Ryan Avent passionately defends the honor of NGDPism against any and all heretics. This time it's GMU wonder boy Eli Dourado in the cross-hairs. But Mr. Avent's analysis, to speak plainly, makes no sense at all. Let's break it down. But people here's the thing. NGDP is PY, the price level times real income. And one of those components, real income, is indeed highly correlated with jobs. The other component, prices, is not. The linear correlation between inflation and jobs growth shown here is 0.22, which is INSIGNIFICANTLY DIFFERENT FROM ZERO (t-stat = 1.01). In other words, one component of NGDP, prices, is not significantly correlated with job growth over this period (not even at the 0.20 level). Another way to see the lack of correlation is to note that if we ran a regression of jobs growth on inflation here the r-square would be around 0.05. The linear correlation between real GDP growth and jobs growth shown here is 0.64 which is SIGNIFICANTLY DIFFERENT FROM ZERO (t-stat = 8.2) at the 0.01 level. The r-square of this regression would be around 0.41. In other words, Mr. Avent is using fluctuations in the real economy to explain fluctuations in the real economy. When real output tanks, jobs tank. 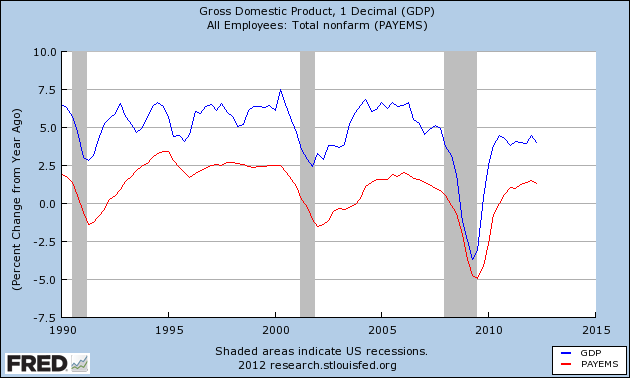 It does appear from the graph that GDP growth might lead job growth, but we are really just graphing the same thing twice here. Really? Bagel Head? With saline injections? Third eye signed? Nod to Jackie Blue, who notes, "Those wacky, WACKY Japanese." Ramesh Ponnuru tells us to stop worrying and love QE3. But Ramesh is not giving you the straight poop! Ramesh: "Long-term interest rates rose after its announcement". Me: sure for one day, then they started falling right back again. Ramesh: "The (stock) market reaction is a sign that this time loosening was warranted". 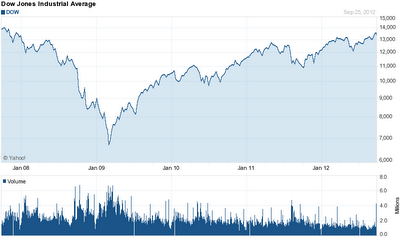 Since early 09, the stock market has been trending up. It's very close to pre-crash levels in nominal terms. QE announcement effects are a drop in the proverbial bucket and certainly don't prove anything about whether or not QE is going to help the real economy. Ramesh: "Looser money is boosting stocks because it is raising expectations of economic growth and thus of future profits." Me: Any evidence or proof to back up that assertion? I see no way for him to show this cause and effect. Do read the whole article. It's really quite bad. The always relevant Soberlook has more information here. Had a lovely dinner at Rasika West End with LeBron and Mrs. Angus. Food was really delicious. We shared a lot of dishes. Appetizers were scallops, asparagus uttapam, & crispy spinach. They were out of this world. I figured then that the entrees probably wouldn't live up, but I was wrong. We had lamb chops, and black cod, and they were great. Didn't have to yell to make ourselves heard, very good service, and incredible food. It's not exactly cheap, but I've had more expensive dinners that I didn't like as much. Highly recommended, though I wouldn't pass up a dinner with that company no matter what was on the menu. PS: only one of us had dessert, can you guess who? Recently I posted about a graph so strange, it could have been made by Salvadore Dali. Well, the mad grapher is back and better than ever. 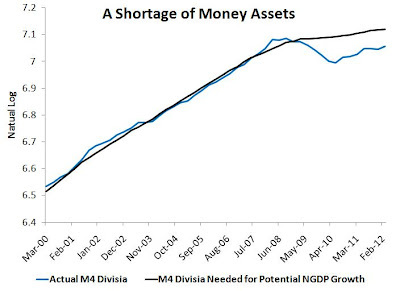 Here we are graphing a decidedly non-standard monetary aggregate created by the Bill Barnett: "CFS M4 Divisia" (you can find some information about it here). 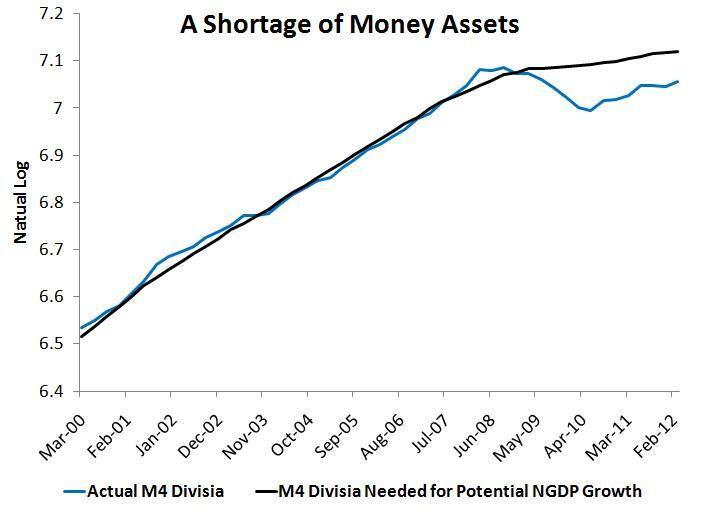 Our artiste creates the other line in the graph, "the optimal amount of M4 divisia by plugging in potential nominal GDP (as estimated by the CBO) and actual trend money velocity (as estimated by the Hodrick-Prescott filter) into the equation of exchange (i.e. M*t= NGDP*t/V*t )." Got that? So we take some non-linear combination of 3 completely made up things to get our crucial real thing. The golden age of journalism is NOW! Crushing expose of Christine Lagarde in this morning's WAPO. Turns out that she's "Chanel Suits and weekend denim". One time in India, she swam laps "extra hard". Kudos to you Ned Martel. You are a giant of journalism. The closest thing I could find that might be of some conceivable relevance in this hum-job of a piece is that Christine buys "Greek yogurt at the Foggy Bottom Whole Foods". Chrissie buys Greek? That's gotta mean SOMETHING, right? Maybe I'll ask her about it tonight. I'm going to Raskia West End, where she often "drops by". There's an old joke. How do you get 100 Canadians out of a swimming pool? You say, "Pardon me, but would you mind terribly please all getting out of the swimming pool?" Well, how do you get old people who shouldn't be driving in the first place to stop ramming US Post Office buildings in Florida? According to the USPS, you say, "Pardon me. Um...PARDON ME! AHHHHHH! STOP RAMMING OUR OFFICE BUILD...(ooof! ow!)" IQ scores have risen....a LOT. Does this mean we are smarter? Not really. But it might mean we think more logically. Whether that is good is another question. I know people, I'm the economics professor. I'm supposed to give answers instead of ask questions, but I'm afraid that all I have here is questions. Read on if you dare. 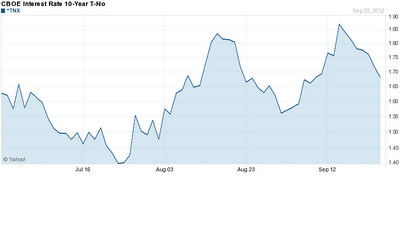 The 10 treasury bond is yielding around 1.7% (none of what follows relies on the exact values of the numbers). 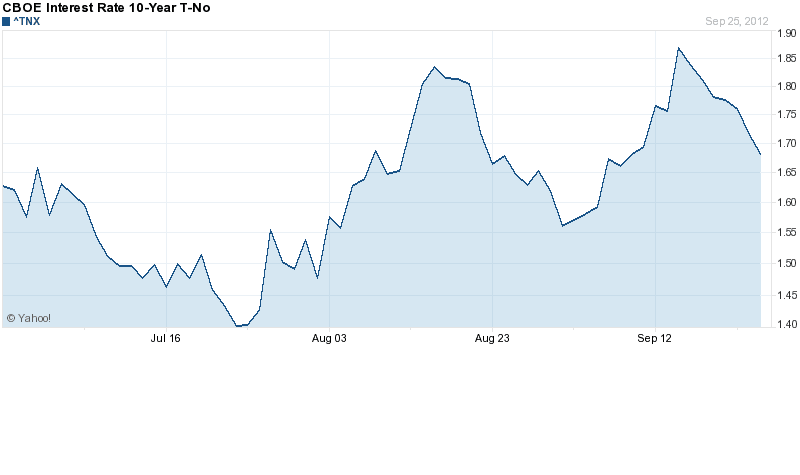 The 10 year TIPS yield is around -.7%. So a common calculation of inflation expectations, so called break-even inflation is at 2.4%. (1) Is this a reasonable measure of inflation expectations and (2) If so, what does it mean about the economy? I question (1) because of concerns about the lack of liquidity in the TIPS market, the old issues of market segmentation, and just generally because equilibrium conditions in financial markets that aren't enforced by pure arbitrage don't actually seem to hold in the data. I did a bit of research and found a couple Fed branch bank papers on the topic (see here and here). Both papers conclude (if I am reading them correctly) that the break-even inflation calculation of inflation expectations probably understates expected inflation! So that leads to question 2. If Inflation expectations are above 2.4%, but the 10 year treasury is yielding 1.7%, why are people holding 10 year treasuries? Because the equilibrium real interest rate on safe securities is negative, like around -1.0%? 4 years after the crisis, risk aversion is so high that people are willing to accept a negative return for in exchange for safety? So either the supply of safe assets is very small, or the demand for safe assets is overwhelmingly high? If inflation expectations at the 10 year window are rising, but returns on 10 year treasuries are simultaneously falling, then the equilibrium real rate of interest on safe assets is getting lower and lower (in our case more and more negative). Does this mean that 4 years after the crisis, people's willingness to undertake risky investments is actually falling? If so, isn't that a very bad sign for the direction of future economic activity? The Baa seasoned bond yield is 4.9%. If inflation expectations are 3%, then the real return to capital is 1.9%? Or does it mean somehow that the supply of safe assets is shrinking faster than the demand for safe assets is falling? Can we just blame Europe? Or are we just making a big mistake in calculating inflation expectations? What If Everybody Flushed Their Toilets at the Same Time? In Zimbabwe, they tried it. To achieve unblockage. Somehow, this makes me think about hyperinflation. But I'm not going to think about it any more. I only speak da troof! I only speak da troof! With thanks to Michael McC, who had BETTER get back to reading Mankiw. Apparently there is at least one city in China where people routinely litter, spit in public and break traffic laws (oh Shaoyang, you know I'm talking about you). This particular city was also short of employees and cash to fight the problems. Their solution? Hire 1000 senior citizens to patrol the streets and LET THEM KEEP 80% of the ticket revenue they generate? Can anyone guess what happened? Yep, those lucky seniors wrote a mountain of tickets. Can anyone guess who's mad? Apparently, complying with the laws is just totally out of the question? The only thing the city did wrong here was that they are paying the seniors $70 some dollars a month. They should have auctioned off the positions, making people pay up front for the right to write tickets and keep 80% of the revenue. Article in the NY Daily News about early voting in NC. Reporter was kind enough to give me a call. It is interesting to think about how early voting changes things. Dems have better organization, Reps have better cash on hand. Early voting has the effect of allowing organization to win. Why? Because (1) you can just pester people on the street: Get on the bus! Get on the bus! Vote for us! Vote for us! (2) people who vote early won't hear the ads in the last two weeks, paid for by the Rep money. A number of people told me, in 2008, they regretted their votes. Bev Perdue ran some remarkably racist ads at the very end. The campaign knew that by then it was too late for the sensible people to take their votes back, and so Bev was free to appeal solely to the wack jobs who were still undecided.